Tryonic Feel 3.7 Back Protector size L to fit height 180/195. Only used twice excellent as new condition. Level 2 protection, size SM. Suitable for people who are between 160cm and 170cm tall. REV'IT - Back Protector FEEL 3.7 RACE (Grey & Blue ) . 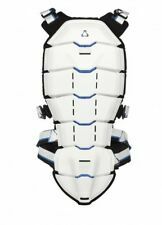 The Tryonic Feel 3.7 Back Protector belongs to the top in its class. The outstanding balance between CE Level 2 impact absorption and wearer comfort is due to the unique construction, and the lightweight components and ergonomics are second to none. APRILIA TRYONIC CE LEVEL 2 BACK PROTECTOR 75% OFF!! !